Oakley Design worked with the Mt. Hood Jazz Festival this year in designing the 2008 limited edition poster for 2008. This poster is among a long list of legendary festival artwork. You can find out where you buy yours here. In 2007 Wacom was looking for a way to publicize the different ways to use one of their new Pen Tablets being marketed for artists of all kinds. These tablets work with any software program on a Mac or PC and provide unique pen-specific features in over 100 software applications using a Wacom cordless and battery-free pen. Wacom called for artists from around the world to submit creations made using their pen. 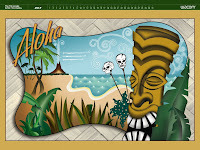 From among the thousands of entrants, Tim Oakley's Tiki design was one of the winners. A complete write up of his step-by-step use of the Wacom pen in creating the artwork is described in Wacom’s "Power of the Pen" website. Oakley Design is pleased to announce it will oversee design and production of this year's 2008 Mt. Hood Jazz Festival official poster. The Mt. 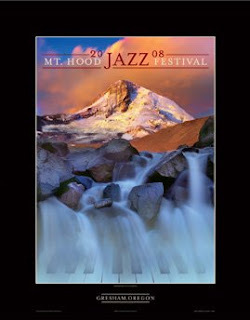 Hood Festival of Jazz takes place August 15-17, 2008 at Mt. Hood Community College. The festival is recognized throughout the country for its fantastic collectible posters of Mt. Hood which it has produced and sold in extremely limited quantities since 1982. The unveiling of this year's poster will take place on July 10th in Gresham.